Diane Sue Leschber, a beautiful and amazing mother, wife, and friend, passed away on Nov. 13, 2010, at the age of 66, after a brave battle with cancer. Diane was born on May 25, 1944, in Moline, to Georganna Irene (Lindburg) and Roger Wayne Jamieson. She graduated from Moline High School and the University of Iowa, where she earned a Bachelor of Science degree in nursing. Diane worked as a nurse in Des Moines at Northwest and Charter Hospitals. Most recently she was a utilization review nurse for UnitedHealthcare in Des Moines. Diane was a devoted member of Sweet Adelines International and Harmony Central Chorus in Des Moines, where she sang lead. In addition to singing, Diane enjoyed gardening, sewing, skiing, cooking, and spending time with family and friends. She had a wonderful smile, endless energy, and positive spirit, and will be greatly missed by all who knew her. Diane is survived by her husband, Ronald Leschber and her children, Kristin Illian (Tony) Mateja and Peter (Michelle) Illian, both of Chicago. She is also survived by her brother, George (Jo) Jamieson, Rock Island; stepdaughter, Jennifer Golden (Larry) Ewing, Urbandale, Iowa; and stepson, John (Jay) Golden, Ames, Iowa. She leaves behind her brother-in-law, Charles (Joanie) Leschber and nephew, Lee Leschber, San Antonio, Texas; nephew, Todd (Ann) Jamieson and great-nephew Christopher Jamieson, Cedar Rapids, Iowa; niece, Ann Jamieson, Farmington Hills, Mich.; and grandchildren and great-grandchildren she adored, Zoe Mateja, Katherine Mateja, Emma Illian, Andrew Illian, Lucas Illian, Jason Ewing, Elizabeth Ewing, Michelle (James Benway) Golden, Krystina (Todd) Curry, Aaron Golden, Staci Golden and Amber Benway. Diane was preceded in death by her parents. Diane Sue Leschber, a beautiful and amazing mother, wife, and friend, passed away on November 13, 2010 at the age of 66 after a brave battle with cancer. Diane was born on May 25, 1944 in Moline, Illinois to Georganna Irene (Lindburg) and Roger Wayne Jamieson. During her childhood she lived in Phoenix, Arizona for eight years before returning to Moline. She graduated from Moline High School on June 4, 1962. She then attended the University of Iowa in Iowa City, Iowa, where she earned a Bachelor of Science degree in nursing in June of 1966. Diane worked as a nurse for many years in Des Moines at Northwest Hospital and Charter Hospital. Most recently she was a Utilization Review Nurse for UnitedHealthcare in Des Moines. Diane was a devoted member of Sweet Adelines International and Harmony Central Chorus in Des Moines, Iowa, where she sang lead. In addition to singing, Diane enjoyed gardening, sewing, skiing, cooking, and spending time with family and friends. She had a wonderful smile, endless energy, and positive spirit, and will be greatly missed by all who knew her. 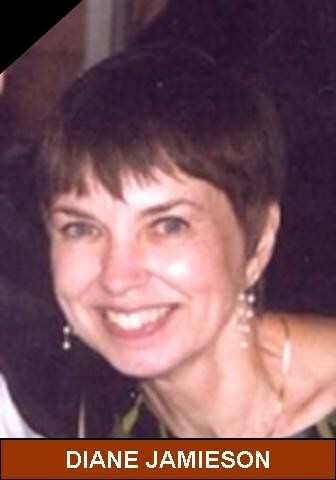 Diane is survived by her husband, Ronald Leschber and her children, Kristin Illian (Tony) Mateja and Peter (Michelle) Illian, both of Chicago, Illinois. She is also survived by her brother George (Jo) Jamieson of Rock Island, Illinois, stepdaughter Jennifer Golden (Larry) Ewing of Urbandale, Iowa, and stepson John (Jay) Golden of Ames, Iowa. She leaves behind her brother-in-law Charles (Joanie) Leschber and nephew Lee Leschber of San Antonio, Texas, nephew Todd (Ann) Jamieson and great-nephew Christopher Jamieson of Cedar Rapids, Iowa, niece Ann Jamieson of Farmington Hills, Michigan, and the grandchildren and great-grandchildren she adored: Zoe Mateja, Katherine Mateja, Emma Illian, Andrew Illian, Lucas Illian, Jason Ewing, Elizabeth Ewing, Michelle (James Benway) Golden, Krystina (Todd) Curry, Aaron Golden, Staci Golden, and Amber Benway. Diane was preceded in death by her parents. Diane's family wishes to thank the staff at the John Stoddard Cancer Center and Medical Oncology and Hemotology Associates, especially Dr. Bradley Hiatt and Carissa Thompson, as well as the staff at Mercy Hospice in Johnston for their compassionate care of Diane during her illness. I'll always remember Diane as one of those rare individuals who always seemed to be happy. She always had a smile on her face and always had a kind word for everybody. I had no idea she had been ill and from reading her profile she certainly didn't let it slow her down. I have many very fond memories of Diane from our MHS years. I hope all the best for her family. She'll be sorely missed.